First off I went to Eurogamer in Leeds back at the start of the month and got to play L4D2 before the demo was out and Avatar the game. Both were great fun. I also saw a load of other games that I've forgotten the names of but they weren't the type of games that I thought would be that good. Then I spent pretty much a whole week at Bradford Animation Festival (BAF). BAF was an amazing experience, I'd never been to an animation festival before and this really impressed me. 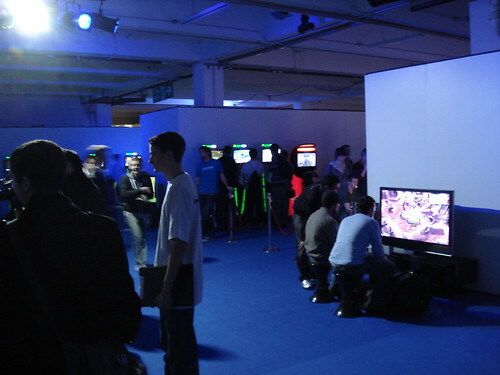 The first couple of days were mainly game company based seminars. I got to see a cool seminar from the guys at Sony about the eyepet, someone from Team17, an indie company who made a great looking point and click game and Ian Livingstonge (Warhammer/Games Workshop/Dungeons & Dragons) of Eidos who was talking about intellectual property. The second day wasn't all that great because I went to all the indie games seminars and a lot of them pulled out and were replaced with some speakers who weren't all that entertaining or informative. Me, Brian, Andre and the puppets. So yeah, that's some of the things I've been up to this month, great great fun! Hello there! My name's Bryn and I love to animate. I've worked in the games industry as an animator for the last couple of years. Currently I work for Warner Brothers (TT Games).